Notes: On Saturday 24 June 1843 the first train ran into a temporary terminus at Folkestone on the west side of the Foord valley. The train carrying SER chairman and directors and invited guests left London Bridge just after 6am and took 2 hours and 40 minutes to complete the 82 mile journey stopping at four intermediate stations. Benjamin Cubbitt, the elder brother of the SER's Chief Engineer William Cubitt, was at the controls. On Wednesday 28 June 1843 the temporary station was opened for general traffic. The opening of the station coincided with the Bayle Fair and the sixth anniversary of Queen Victoria’s coronation so the town was already in festive mood. Throughout the day many local people made their way to the station to see the trains. The first train from London Bridge arrived at 10.30 am to be welcomed by much cheering from the enthusiastic local gathering. Coaches were waiting at the station to convey passengers on to Dover where many if them boarded steam packets bound for the continent. 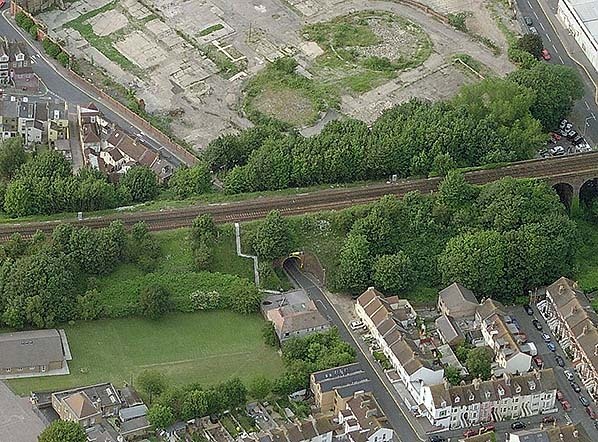 Once the temporary station had been opened work on completing the Foord Viaduct progressed rapidly with the permanent station at Folkestone expected to be open by the late autumn. This was, however, delayed fallowing a serious landslip on the massive embankment between the station and the viaduct. The viaduct was finally completed on 20 November 1843 with the first locomotive running over it the following day and a series of trials taking place three weeks later. On 14 December a special train once again carried the SER's board of directors, this time over the viaduct and into the new Folkestone station. On Monday 18 September the temporary station closed with trains being extended into the new terminus. The temporary station was quickly demolished. Click here to see a film of a train journey between Folkestone Junction and Dover Priory in the 1920s including a view of Folkestone Warren Halt. 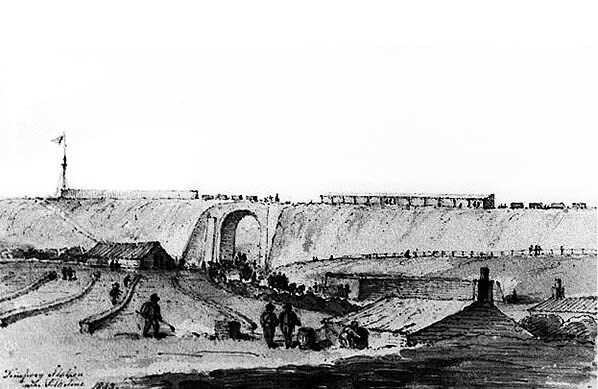 1843 sketch showing the temporary terminus on the embankment. 1872 1:2,500 OS map. The temporary station was located to the east of the arched bridge in the centre of the map. 1898 1:2,500 OS map shows two ramps up the embankment at the site of the temporary station. It is unlikely that these are anything to do with the station as they are not shown on the earlier map. By this date Central station had opened to the east, Click here for larger version.